click on thumbnails for larger image, sorry about quality. The downside – you knew there would be one, didn’t you? – is that it’s a Symbian Series 60 3G product only at the moment, which may reflect the fact that it’s still in beta. 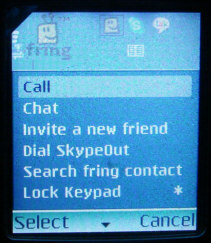 In fact right now it will only work with around seven Nokia phones, including the N70, N90 and 6630. But the promise of free…er cheap… mobile to mobile voice calls without WiFi, extra hardware or a PC means that this is a winner tech in every way. The sound you hear is a pack of mobile telco executives running around in circles wailing and gnashing. 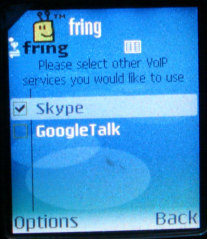 I tried it on my N70 handset in a very patchy 3G reception area and the voice quality was superb at my end, although my brother in law in Spain was having trouble hearing me due to break up. 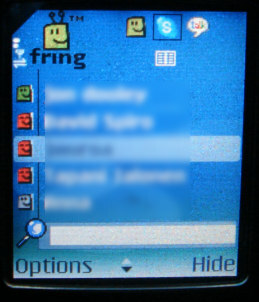 But a free voice call to Spain from my mobile was pretty cool all round, so I kept grinning. 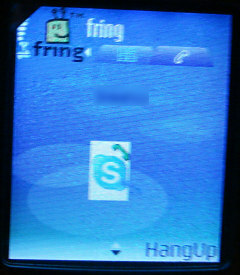 By the way, the sound effects you hear are the exact same Skype sounds, including the ring tones, which is quite neat. The real trick to this service of course is to find a cheap or flat rate data plan from your mobile service provider to keep the ‘free’ calls as cheap as possible. It will be interesting to see whether data plans which ban Skype – like T-Mobile’s Walk n’Talk – will react to this kind of middleware software by banning them as they come on to the market, or whether they’ll change their business plans to avoid confrontation. My bet is on the latter. Eventually. 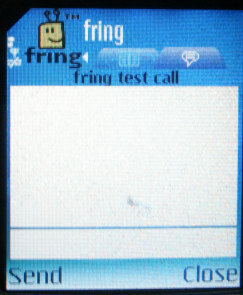 Anyway for now, Fring has the market just about to itself, and it works. The company behind it say that they’re currently focusing solely on the user experience, so they have no plans to charge for the service, which leaves a big question in terms of how they’ll fund the business long term, but we’ll see. Another big test will be to see how well the system scales. It’s OK running gateways on small beta programs, it’s only when you’ve got several hundred thousand users all logging on to chat at once that you’re going to know exactly how robust your system is. 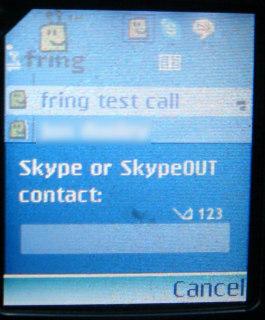 Which may be part of the reason why the system currently only works on a limited number of handsets. Oh and yes, it’s an international service, so there’s no geographical constraints to using it as long as you have 3G in your location. Give it a go and let me know what you think. Briing.com uses different access numbers instead of Voip, or beta trial has residential quality and also offers free calls. We are all startups and they key is the usaerability of the end product, it has to be easy. Briing so far only works in the UK but will grow massively fast.